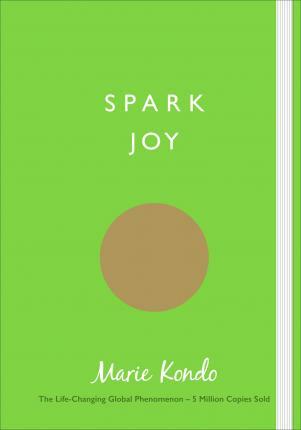 Spark Joy is an in-depth, line illustrated, room-by-room guide to decluttering and organising your home, from bedrooms and kitchens to bathrooms and living rooms as well as a wide range of items in different categories, including clothes, photographs, paperwork, books, cutlery, cosmetics, shoes, bags, wallets and valuables. Charming line drawings explain how to properly organise drawers, wardrobes, cupboards and cabinets. The illustrations also show Ms Kondo's unique folding method, clearly showing how to fold anything from shirts, trousers and jackets to skirts, socks and bras. The secret to Marie Kondo's unique and simple KonMari tidying method is to focus on what you want to keep, not what you want to get rid of. Ask yourself if something `sparks joy' and suddenly it becomes so much easier to understand if you really need it in your home and your life. When you surround yourself with things you love you will find that your whole life begins to change. Marie Kondo's first book, The Life-Changing Magic of Tidying, presents her unique tidying philosophy and introduces readers to the basics of her KonMari method. It has already transformed the homes and lives of millions of people around the world. Spark Joy is Marie Kondo's in-depth tidying masterclass, focusing on the detail of how to declutter and organise your home.